WiFi networks were originally built simply with coverage in mind. Access points were installed in rooms where WiFi was “necessary” and other rooms were left untouched. But, as businesses began migrating from Ethernet to a complete WiFi-only infrastructure, this made WiFi a mission critical service to business objectives. 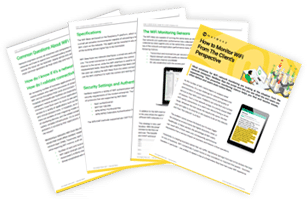 In this post, I’ll outline 6 characteristics of high performing WLANs which will do away with frustrated end users and get your business back on the track to productivity. In the bustling tech hub of San Francisco, a tech-centric business relied on WiFi for all operations, including the need to access the cloud. The increased uploading and downloading traffic patterns began slowing down WiFi. To help increase productivity and take advantage of the investment made into the WLAN infrastructure, we helped plan and design a WLAN for this company. This WLAN would allow for a better user experience, as well as, an increase in performance and reliability. If you give your finger a quick lick and put it up in the air, then you turn to your installer and point to randomly selected areas of the ceiling and say, “Put a WAP here, one over there, and one right here and we should be good…” – this is a recipe for disaster. To deploy a high performing WLAN, in which your workforce heavily relies on, requires more than guess work. It requires a proper design which begins with gathering requirements. When it comes to upgrading the core network, WiFi must be treated the same. Treat WiFi as an extension of your wired network. Planning upfront will lay the foundations to a WLAN designed to fit the business needs. A WLAN must be designed for a mobile workforce. The technical professional must have in-depth WiFi knowledge and understand the knobs required to tune for the specific environment. Accessing information quickly and easily on any wireless device is what drives the mobile workforce. WiFi is now the primary access; businesses have been migrating from Ethernet to an all-wireless infrastructure. That means the WLAN infrastructure must be reliable. Redundancy builds a robust WLAN infrastructure to prevent major outages and prevents loss of productivity and loss of potential revenue. Ensure the WLAN is built with excellent backend infrastructure. In 2007, TJ Maxx had a cyber security breach of their credit card data because of weak WiFi security. Don’t become the next headline. In today’s workplace, everyone is accessing the cloud at all times. WiFi is now the primary method of access to network resources. People are carrying up to 3 or 4 devices at a time and needing to get their work done from any of those devices. To provide a boost in productivity and effectively collaborate with others, slow or unresponsive WiFi must be eliminated. A well performing WLAN always goes back to reliability. An increase in reliability boosts end user productivity. Users can perform their work efficiently and from anywhere in the office. Voice calls are often done over WiFi due to a lack of LTE signal penetration into the building. Video conferencing and streaming is putting a strain on the WLAN as well. Plan for these workloads. The quality of the users’ work while using WiFi can be directly matched to the reliability of the WiFi network. As people begin working in the office at early hours, the WiFi network will be humming. As more people begin to fill in their seats some start noticing a degradation of WiFi service. The increase in number of devices creates a high density situation; with the average person carrying 3-4 devices, this can put a strain on the WLAN. The types of applications used on each of these devices defines how well a WiFi network will perform. If it was designed according to requirements, it will perform as expected. Without planning for capacity equates to planning for failure. How do we know if a WLAN is performing? Is the IT support staff armed with the right tools to understand the state of the WiFi network. Analytics can provide valuable insight into how the WiFi network is being used and to what capacity. This information can lead to optimizations for increased end user experience. With such powerful information on-hand, we can improve root cause analysis, decrease the length of time spent during the investigation process, and improve time to resolution. WiFi networks are more complex than ever. The 6 characteristics are: starting with a plan and design based on requirements of the business and end users, reliability to ensure devices can connect when they need to, security – which should be thought of starting from the beginning of the design, WiFi networks should provide a good end user experience and less frustrations, built for capacity as more devices are brought onto WiFi, and should be monitored to investigate any issues, find trends, or to be proactive.